Of course, dogs evolved from wolves, but it’s definitely not as advertised. Dogs evolved from a wolf species circa 40,000 years ago. And that species is long gone. Dogs-wolves – not sure what to call them when they were in the process of evolving – actually hunted in tandem with Cro-Magnon men. And it turns out that sharing a bed with dogs isn’t a new thing. 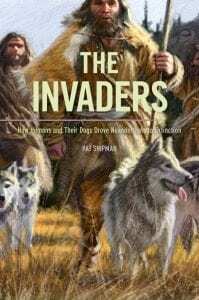 Without space heaters, the dog-wolves kept us and our babies warm, and safe; they could hear and smell danger better than we could), and we kept them and their pups safe because we had spears and smarts. What’s amazing is that the two predatory species didn’t eat one another’s young. No one knows exactly how that trust was developed. According to the film Alpha, now available on Netflix, a young Cro-Magnon man coming into his own was left for dead on a hunting expedition. His father and the remainder of the tribe reluctantly returned. How was he to survive? He was injured, and so was a wolf who he met face to face. He didn’t kill the wolf. And the incapacitated wolf wasn’t capable of killing him. Over time they forged a mutual trust. On their way back home, he saved the life of the canine and visa versa. They had one another’s backs. Spoiler alert: They both make it back alive. And guess what, puppies arrive. And being raised with humans, though wolves, they’re trusting. And that’s how our relationship with man’s best friend began. Well, not quite. But the movie isn’t totally wrong. Scientists suggest our Cro-Magnon ancestors weren’t so adept at recycling. They maintained garbage dumps on the perimeters of their villages and figured out that having relatives of today’s grey wolves hanging out there was actually a good thing. Those wolves ate disease-carrying rats and also warned one another when predators approached. These warnings gave the people in the villages time to mobilize and use whatever weaponry they could against sabre-toothed-type predators and giant bears. A symbiotic relationship began to occur, benefiting both the wolf species and our Cro-Magnon ancestors. Over time, bold individual canines infiltrated the human settlements, which afforded them protection and food. They even raised their puppies alongside humans. While nowhere near domesticated, the puppies raised with people were tame. We presumably continued to benefit by their social systems warning one another, and therefore us, of predators. Wolves have a superior sense of smell and hearing to humans. As more trust was formed, Cro-Magnon humans began to hunt with these canines, and began to crudely breed for that skill. And as we lived with these animals, even sleeping with them – any aggressive wolves were likely killed (if they didn’t kill us first). We bred for tameness. Pre-Uber, dogs were all we had, and they could find dinner—the dinner we had just shot with a bow-and-arrow—faster than people. 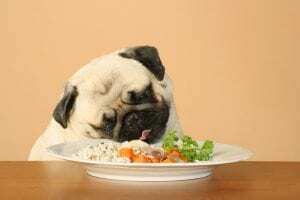 Any leftovers were likely provided to the canines, now maybe dog- wolves rather than wolves as the process of selective breeding was taking hold. The dog-wolves must have been important. People even worked to keep them well. Who knows what that veterinary care was, but evidence suggest people tried to care for their dogs. And when they both succumbed, they were often buried together. The DNA from today’s grey wolf, as well as the jackal and coyotes (which come into the story later), is sprinkled in today’s domestic dogs. Scientists are still unraveling the details to determine the exact correlation, but it’s clear that dogs are not evolved from grey wolves. With tameness physical changes appeared in dogs-wolves over time, including splotchy coats, curly tails, and floppy ears, follow a pattern of a process known as self-domestication. It’s what happens when the friendliest animals of a species somehow gain an advantage. Friendliness somehow drives these physical changes, which can begin to appear as visible byproducts of this selection in only a few generations. There is very little grey wolf in any domestic dog. 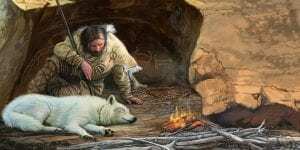 Several studies, including one from PLOS Genetics: Genome Sequencing Highlights the Dynamic Early History of Dogs, reveal that dogs and grey wolves share a now-extinct common ancestor. While dogs can breed with wolves, it turns out that dogs did not evolve directly from the grey wolf, and we can only surmise details about the ancestor today’s domestic dogs. Dogs (canis familiaris) are the most diverse species on the planet. 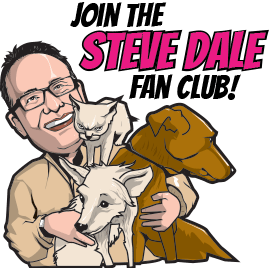 From the Chihuahua, which can weigh as a little as three pounds and fit into the palm of the average human’s hand, to the Irish Wolfhound, which might as well be measured in hands like horses, standing as high as 35 inches. But size is only the beginning of the differences between the many dog breeds. Coat color and texture, general body shape, temperament (based greatly on what individual breeds were first bred for), and other characteristics show how diverse the species truly is. Arrive here from outer space and it might be difficult to believe that the Pug and the Great Pyrenees are the same species. Wolves are smart, some have suggested they’re cunning. Dogs aren’t as smart, and their brain size compared to body size is smaller than the wolf. When given a problem, after a while (sometimes sooner than later) a dog will look to a person for the solution, or just give up. Wolves are more resolute to problem solve and are more likely than dogs to work with a friend to find the solution. Wolves raised with people may ask people for help and follow the human gaze. However, these attributes are hard wired in all dogs, which, from an evolutionary perspective makes sense as their survival then depended on people and it continues to. Of course, wolves are far better hunters than dogs. In places where there are stray dogs, such as third-world countries, dogs’ primary source of sustenance are garbage dumps or handouts. On the rare occasions they do hunt, dogs hunt as individuals, mostly not in packs cooperatively as wolves. Dogs are simply not very skilled hunters. In fact, living on their own outdoors cats are generally far more self-sufficient compared to dogs. Friederike Range, a behavioral biologist at the University of Veterinary Medicine Vienna, and her colleague Zsófia Virányi studied a captive population of wolves and dogs raised together at the Wolf Science Center outside Vienna. They found that wolves work together better than dogs do. For example, Range and Virányi observed the behaviors of groups of wolves or dogs sharing a common food source provided by researchers. Although there was more aggression among wolves—from muzzle-nipping to growling – every wolf, even the so-called lowest ranked, was able to negotiate a share of food. Dogs are less aggressive with one another and food sharing is far from collaborative. Do You Train as an Alpha? Famed TV personality Cesar Millan, aka the “Dog Whisperer,” suggested training dogs using certain methods because the head of the household needs to act like “the boss,” or like an alpha wolf. That’s why Alpha is an unfortunate name for the movie, it propagates mistaken notions. It’s unclear what that being “dominant” or “alpha” over a dog means. That’s because wolves do not live in packs which there are truly ‘alpha’ as described my many. Famed wolf biologist David Mech, who coined the term, notes that wolves mostly live in families, and has indicated many times that the term “alpha” was incorrect. However, this fact is lost on Millan and many dog trainers who suggest dominant and alpha are appropriate for best teaching dogs, as if they are wolves. 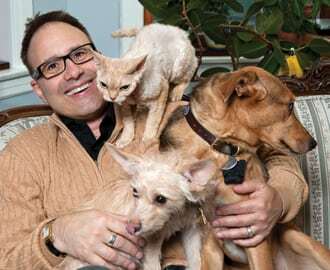 Yes, dogs do seem to have a certain rank among members of their own species, either living in our homes, or at garbage dumps, as studied by the late Dr. Raymond Coppinger and others. However, these relationships are complex and based on context, and are frequently in flux. Also, dogs are keenly aware that we’re not dogs. There’s no reason to pretend we’re another dog. Of course, being consistent and reinforcing, and providing structure helps dogs to learn. Dogs learn best through motivation, not intimidation – and several studies, including from veterinary behaviorist Dr. Theresa DePorter, support positive reinforcement puppy classes keep dogs in homes far more than aversive training. Wolves are considered carnivores by nutritionists, though they will forage, depending on the species and geography of where they happen to live and what food is available. Dogs are far more omnivorous. Here’s a shocker: Dog GI systems and nutritional needs are in some ways more like ours than wolves. This is based on a 2013 study, which others have since confirmed. Erik Axelsson and colleagues compared the genes of wolves and domestic dogs and found some very interesting differences. 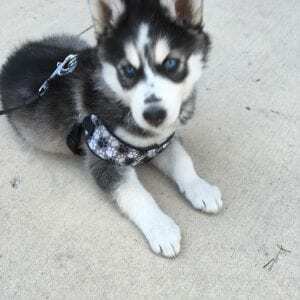 Dogs have three genes that wolves don’t have, all of which play an important role in the digestion of starch (the genes are AMY2B, MGAM, and SGLT1). This means that dogs can handle carbs! Axelsson, an evolutionary geneticist from Uppsala University in Sweden, compared dog and wolf DNA to learn which genes were important for domestication. They sequenced DNA from 12 wolves from around the world and from 60 dogs representing 14 breeds. Dogs had four to 30 copies of the gene for amylase, a protein that starts the breakdown of starch in the intestine. Wolves have only two copies, one on each chromosome. As a result, that gene was 28 times more active in dogs. More copies means more protein, and test-tube studies indicate that dogs should be five times better than wolves at digesting starch, the chief nutrient in agricultural grains, such as wheat and rice. 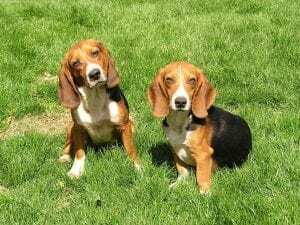 Dogs and wolves do have the same number of copies of another gene, MGAM, which codes for maltase, another enzyme important in starch digestion. 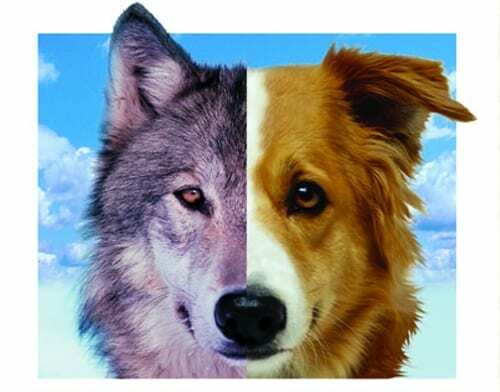 But there are four key differences between the sequence in dogs and wolves. One difference causes dogs to produce longer versions of maltase. That longer protein is also seen in herbivores, such as cows and rabbits, and omnivores, such as mouse lemurs and rats, but not in other mammals, suggesting length is important to plant-eaters. These differences make the dog maltase more efficient. None of this should be a surprise considering that we shared diets with dogs long before the advent of dog food. So, it turns out dogs are behaviorally different than wolves; their brains have developed differently, and their nutritional needs are different. Good or bad? I don’t know, but I do know that the pup who shares your bed is no wolf. Think twice before you fall for the marketing ploy from dog trainers or pet food companies.